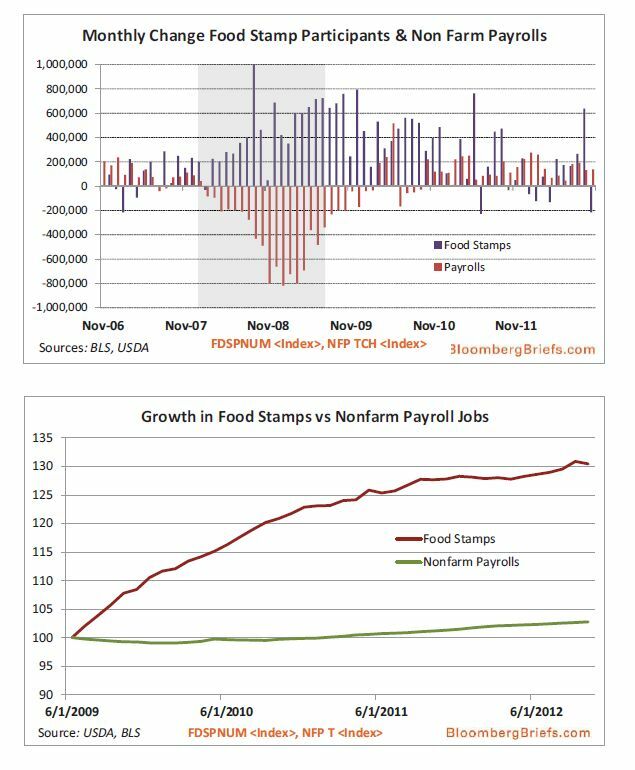 Summary: Today we have a graphic that tells us much about both the recovery and the trends shaping the New America — growth in food stamps vs. jobs. What forces drive these contrasting trends, and how will they help reshape America? Below we see the US recovery in one graphic, from the February 4 issue of Bloomberg Briefs. It shows the weakness of the recovery, but has another and deeper lesson for us. The pressure of the Great Recession on business accelerated existing political and economic trends. As a result the New America has an increasing fraction of jobs that are some combination of minimum-wage, temporary, part-time, and with no benefits (Wal-Mart and Amazon have perfected these tactics; see the links below). Free competition, open borders to immigration, and the destruction of private sector unions all contributed to this situation. Despite what we’re told, this was not inevitable or immutable by public policy. The nations of Northern Europe have shown this by the successful protection of their middle classes. 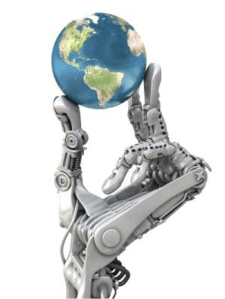 This structural change in the bargaining power of management and labor puts us in a weak position to cope with the robot revolution, the next wave automation (see posts below for descriptions and analysis). Employers have learned to structure their workforce to minimize wages — and prevent unionization (including defanging the New Deal’s labor protection laws and agencies). The next wave of automation will further erode away both jobs and skill premiums, pushing more people into the ranks of the marginal workers. Of course, these tactics do not work as well with creative jobs. For them employers have developed another set of tactics: make your workers entrepreneurs (ie, self-employed independent contractors). This has long been used when hiring actors, models, musicians, and artists. The result: a few rich superstars, a small number of upper-income stars — and a mass of people barely getting by. To see how this works — and feels — read Linds Redding’s “A Short Lesson in Perspective“. 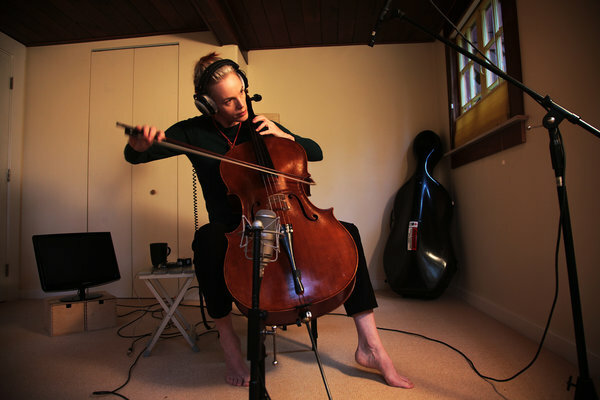 Delivery of services via the Internet makes this even easier, as described in “As Music Streaming Grows, Royalties Slow to a Trickle“, New York Times, 28 January 2013. It’s a model that will work for a wide range of skilled people, as we’ll see during the next decade. Government aid to the working poor allows the development of a subsistence labor force, in which taxes provide indirect subsidies to corporations. This is the exact opposite of what we’ll probably need to maintain a middle class during the robot revolution: some form of government action to force wider distribution of the profits from automation (ie, the fruits of increased productivity). The next few decades will be interesting. Will we allow these trends to help the 1% reshape America, or will we follow the Founders’ example and take command of events — and make our own destiny? Can we work together to form powerful political alliances, and then make wise decisions? “Amazon unpacked“, Financial Times, 8 February 2013 — “The online giant is creating thousands of UK jobs, so why are some employees less than happy?”. Amazon treats its workers like robots, making the future transition to robots easy. Previous Post How do our leaders see us? Don the shoes of the 1%. Look down on the 99%. Describe the view.